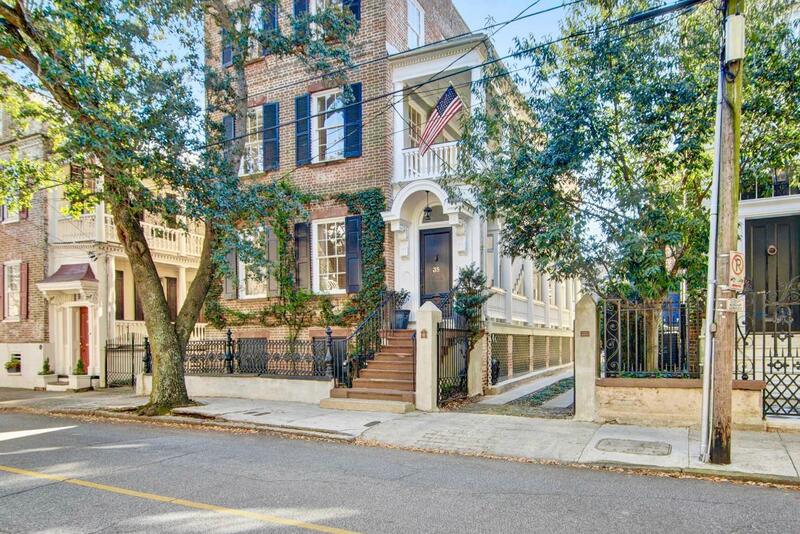 All the charm of the Charleston of old, with all the modern conveniences and updates of today! This completely renovated flat occupies the main floor of the c. 1843 John McNellage House in the heart of historic Ansonborough. Ascend the front sandstone stairs and under the Italianate door hood onto your deep and winding piazza, or park in your off-street parking place to go up the rear steps. Note the one-of-a-kind etched glass panes as you swing open the main door to the foyer, replete with authentic Greek Revival moldings (as is the rest of the home). To the left is the original Drawing Room turned Master Suite, with abundant sunlight from the four windows overlooking this charming and quiet street. Back through the foyer and past the powder room you'll enter the new parlor in the form of a spacious living room, with built-in bookcases flanking the original marble surround of the fireplace (non-functional). To continue through the enfilade of rooms will bring you to the cozy Dining Room, again with fireplace and built-in storage, as well as a second exterior door to the piazza. Finally, the tour of this showcase wraps up in the all-new kitchen with custom paneled cabinetry, subway tile backsplash, and all the necessary appliances (including stacked washer and dryer). Ceiling heights of 11' along with original antebellum woodwork and heart-of-pine floors are found throughout. This stretch of Hasell Street is one of the most desired in the neighborhood and the city, and from your new home you'll be steps away from the recently revamped Gaillard Center- home of world-class performances and events; grocery and other convenience stores, fantastic dining and nightlife options, shopping, parks and more! Schedule your appointment today to add your story to this home's history.